The Beyerdynamic T1 second generation is a fantastic pair of headphones. They have a warm and smooth sound signature, are extraordinarily comfortable, and have a clear and crisp sound. The only downside is the hefty price tag, but if you’re willing to pay for quality, then you’ll certainly be happy with these headphones. Disclaimer: Beyerdynamic provided me with a review sample of the T1. This does not, however, affect this review in any way. This review is my personal and subjective opinion. Below, you’ll find our detailed Beyerdynamic T1 review. You can skip to a specific part using the quick navigation links below. When the package arrived, I was so excited to crack it open and hold the infamous Beyerdynamic T1 in my hands. But I had to hold my horses, as they say. I am, after all, composing a review of these beauties. The first thing you’ll notice when examining the packaging is a high level of quality. This is pretty much the exact same packaging as the Beyerdynamic T5p and those of you who have seen it will know that it’s high quality. The front of the packaging shows a picture of the T1, while the back lists the specifications of the headphones. It is possible to open the front of the box, to be able to read more about the headphones. This is a feature that I’ve seen Beyerdynamic and some other headphone brands do, make the front openable. It really adds to the overall first impression of the headphones. As you can see, there aren’t a ton of accessories. The necessities are included, but nothing more. On the back of the box, Beyerdynamic recommends the A2 amplifier to be used with the T1. This is the one I’ve been using, and the combination is absolutely wonderful (more on that later). The Beyerdynamic T1 is a beautiful pair of headphones. On the back of the earpads, you’ll find a very well made metal grill. It feels very solid, and they look absolutely fantastic. The other side of the earpads (the ones that cover the ears) are covered with fuzzy velour. It is very comfortable to wear and, as it’s velour, you won’t build up a sweat. This is a problem with some leather earpads. The earpads go all the way around the ear. That is, they don’t touch your ears at all. Moving along. The earpads are connected to the headband with the help of robust metal. It is beautifully designed and has a ‘T1’ engraved in it. To make keeping track of how far the earpads are extended easy, there are located a couple of dots on the back of this metal. The headband itself is made from leatherette and is incredibly soft. The Beyerdynamic T1 is a heavy pair of headphones, so a good headband is a must. Luckily there’s no issue here, as the headband provides phenomenal strain relief. As you may have noticed, there really isn’t anything bad to say about the design and build quality of the T1. We touched upon this in the Build Quality and Design section. Overall, the T1 is an incredibly comfortable pair of headphones. Even though they’re massive, the cushions on the earpads and headband make up for it. In fact, wearing them for several hours is no problem at all. I’m sure this is what Beyerdynamic went for, and they achieved their goal. These headphones have an open back, which means they have hardly any noise isolation at all. This isn’t really a problem in most cases, as the T1 requires an amplifier to be driven, meaning you’ll mostly be sitting in a living room or an office when you’re listening to them. I suppose it might be a problem if you’re in a noisy shared office. If you’re looking for more isolation, the T5p might be a better choice. Now for the interesting part — the sound quality. For the given price, it should come as no surprise that the T1 packs a great audiophile sound. Perhaps too much so. The T1 is absolutely fantastic with genres like jazz and classical, while not brilliant for electronic music. It seems as if they’re designed specifically for genres that audiophiles tend to listen to, which of course is fine. It only means that if you’re mostly listening to EDM or something similar, then you might want to look elsewhere. Overall, the T1 is a warm and neutral sounding pair of headphones. Perhaps the strongest point of the T1 is the mids. They are exceptionally clear and make vocals sound absolutely astonishing. Those of you who enjoy great vocals will love these headphones. They are for the most part up front and centered. Another strong point is the bass. It is full and rich and packs a great punch. Don’t get me wrong here, the T1 is not a bass heavy beast. Many headphones seem to either have too much or too little bass. It has, in my opinion, a perfect balance. You can almost feel the bass drums in the large orchestra. It’s a wonderful sound experience. The soundstage and instrumental separation are very nice. If you get a chance to try these headphones out, try to listen closely to the cymbals of your favorite track. You should be able to hear them in the back of the band, yet clear and precise. The highs are smooth and a joy to listen to. They are well behaved, and you won’t experience any listening fatigue. They could definitely be slightly tighter, though. As you might have observed, I don’t have many bad things to say about the sound quality of the Beyerdynamic T1. While I’ve never heard the original T1 myself, I’ve heard countless people say that the second generation is a lot more well-behaved and that Beyerdynamic has done an excellent job of correcting the issues with the first generation. Overall, the T1 packs a fantastic sound signature. Warm, smooth, and with an adequate amount of bass. I can hardly ask for more. If you ever get the chance to listen to them in a hi-fi store, go for it. If you like them, you’ll most likely get hooked. The value is always sort of tricky to access on headphones like this. On the one hand, they deliver quality beyond most other things. On the other hand, they come with quite the hefty price tag. That being said, I think the T1 delivers a quality that is worthy of the price they’re asking for them. It could maybe be a tad bit cheaper, but as people are happy to pay this price for such a quality pair, Beyerdynamic has no reason to reconsider the pricing. How Does the T1 Compare? Let’s look at how the Beyerdynamic T1 compares to some other headphones. These are two of the flagships of the audiophile Tesla series. They have many similarities, but yet are slightly different. I’ve seen a lot of people claim that these two headphones have completely different sound signatures. While they are different, I don’t think the difference is as large as many people claim it is. There will obviously be a difference, as the two headphones are built differently. The T5p are closed-back headphones, while the T1 are open. The T5p are portable 32 Ohms, while the T1 is 600 Ohms. This last point is what I think is the most important aspect to distinguish the two. If you’re considering between the T1 and the T5p, reflect on whether or not portability is important to you. By that, I mean whether or not you want to be able to play them using your phone or a different portable player. With the T5p, this is possible. It will allow you to go for walks with them, or listen to them on the bus or train. The T1 is a different story. Here you’ll need an amplifier to drive them at all. For this reason, you will mostly be listening to them while sitting put. Overall, the T1 is the better headphones. They have a better soundstage, separation, and, in my opinion, sound signature. The question comes down to whether or not you want the portable option. Read the complete T5p review here. This is another interesting and common comparison. The T1 has an overall better build quality and is more comfortable to wear. With regards to sound signature, they are quite similar. Though, the T1 has a clearer and more vivid sound. One of the main differences is the spaciousness and the instrumental separation. The T1 is simply better in these two categories. The T1 sounds a lot more present, as opposed to the DT880. The most important thing to consider when contemplating between the two is the price. The DT880 is quite a bit cheaper than the T1, so if you’re on a budget, go for them. If you’re not limited by a budget, then the T1 would be my recommendation, as they’re my personal favorite. Here’s a good and detailed comparison between the two. Keep in mind that this is the first generation, though they do have quite a few similarities. 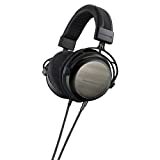 Should I Buy Beyerdynamic T1? When you’re considering whether or not to go with the T1, the main thing to think about is the price. There are many good headphones from Beyerdynamic that can deliver perhaps 70% of what the T1 does, and they are quite a bit cheaper. Nevertheless, if it is quality that you’re looking for, then yes, the T1 is an excellent choice. Keep in mind that you’ll also need to invest in a proper amplifier, if you do not have one already. I’ve been using the A2 from Beyerdynamic, and let me tell you that this combination is a wonderous sound experience. The T1 packs an absolutely fantastic build quality, a wonderful sound quality, and a soundstage that will blow your mind. The only downside is the hefty price tag. If you’re looking for a high-end pair of headphones and aren’t worried about the price, then look no further. I can almost guarantee that you’ll be very happy with the T1.